Public parks are excellent places to picnic, play away some adrenaline, and spend quality time with the ones you love. There are lots of great public parks throughout Virginia’s Blue Ridge that offer all that and more. We have beach access, mountain biking trails, river access, and key attractions located within our parks. Visit to #FindYourPark and fall in love with our favorite green spaces. Here’s your guide to some of the best public parks in Virginia’s Blue Ridge. Recently renovated Elmwood Park is widely known for its amphitheater welcoming concerts and entertainment, but there’s more to Elmwood for daytime visitors. The Peter Pan Playground is a fun space for little ones to run off steam, and then families love the fountains located at the base of the amphitheater stage for a cool down. If there’s no event planned for the day, the fountains are on for all-day water play. You can also check out the unique sculptures on display as part of the Elmwood Art Walk. 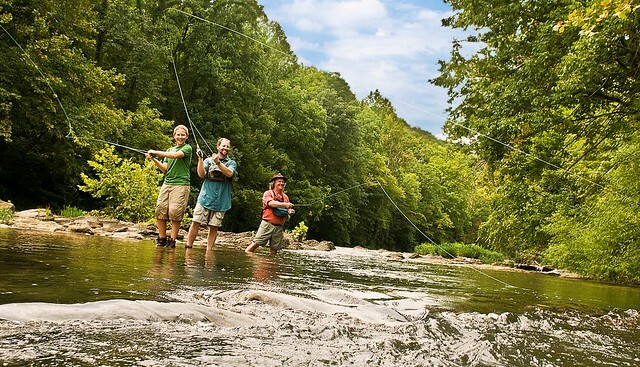 The one-mile stretch of park frontage on the Roanoke River is stocked with trout. Anglers with the appropriate license will enjoy casting while also being mindful of those tubing, kayaking, and canoeing past. The Roanoke River Greenway also runs between the park and the river, and is popular with cyclists, walkers, and joggers. Seven miles of shaded trails wind around the Pigg River, the venue for the annual Pigg River Ramble. A few miles of the trails are ADA compliant, meaning Waid is an ideal place for visitors of all abilities. Ball fields and a boat launch put recreation at hand for anyone who wishes to partake. In summer months, tubes are available for hourly and daily rentals for families interested in floating the river. Not long after it opened in 2014, the disc golf course at Greenfield was ranked 20th in the world (out of 5,000 courses, mind you) by DG Course Review. It’s one of many fantastic courses in Virginia’s Blue Ridge. If disc golf is not your thing, the trails around Greenfield are appreciated by runners, bikers, and those on horseback. We happen to love the views, so you can always take a load off and sun, read a book, or chat with a friend, too. Don&apos;t forget to make time to include a stop for a few pints and great food at the nearby Ballast Point Brewing Company Tasting Room. 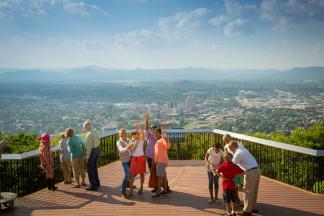 The icon of Roanoke - the Roanoke Star - sits high on Mill Mountain, but it’s not the only thing up there. If you’ve never hiked, biked, or otherwise experienced Mill Mountain, you’ve missed out. Not only are the trails pretty rad, but the Mill Mountain Zoo and Discovery Center are family-friendly destinations worthy of your attention. Not to be confused with Smith Mountain Lake State Park, Smith Mountain Lake Community Park is 37 acres of low-key family fun. The beach has a lifeguard on duty (in season), and the nearly two miles of trails are nice for an afternoon hike or bike ride. Those who love to fish will find an accessible and partially covered fishing pier from which to cast a line. A playground, picnic shelter, and restrooms help to serve up a full day of fun. A nice maze of trails, disc golf, and collection of sports courts make Walrond Park like most other parks in Virginia’s Blue Ridge. However, the soap box derby track is an interesting amenity not found anywhere else. Now, who has a derby car we can race? Talk about old school fun! A one-acre fishing pond is surrounded by about 150 acres of outdoor activities at Franklin County Recreation Park. Playgrounds, disc golf, miles of shaded trails, picnic shelters, ball courts and fields, horseshoe pits, and an amphitheater make it a treasured resource for the community and visitors alike. 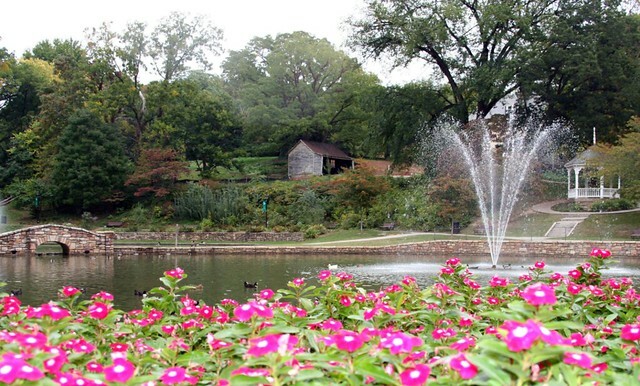 Mingle with the wildlife at Lake Spring Park. Specifically, the resident ducks love attention. Children 12 and younger are also welcome to fish the lake. 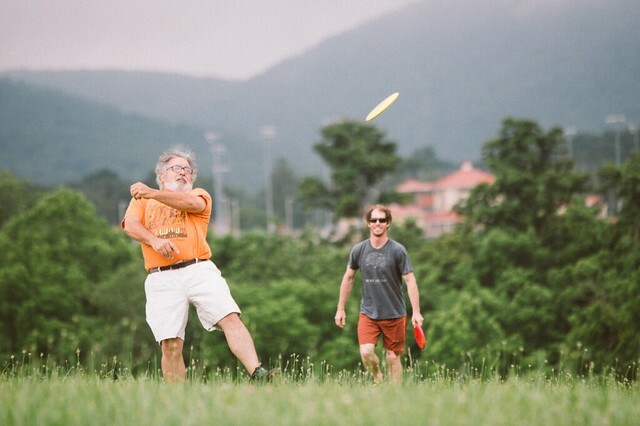 The perfect place to let your dog run (somewhat) free and make friends at the dog park or challenge your squad to a round of disc golf is Highland Park. 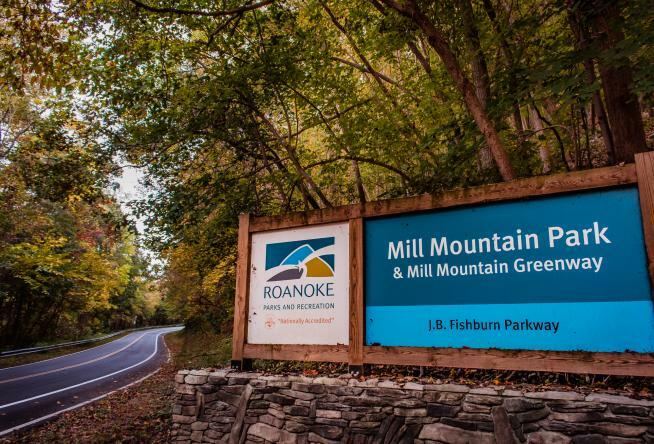 Located in Roanoke’s Historic Old Southwest community, the park is shady with rolling hills, walking paths, tennis and basketball courts, and offers a great view of the Roanoke Star. Mountain biking trails and Philpott Lake access are the key draws for those who visit Jamison Mill Park. Launch a kayak and spend the day on the water, picnic, hike or bike the winding trails, or simply enjoy the abundant wildlife at the edge of one of Virginia’s largest lakes. One of a string of parks lining the Roanoke River, Wasena is a popular park for locals and visitors alike. Not only does the Greenway run through it, but there are great picnicking spots and a fun skate park. Shoot some hoops or swing your racket for a game of tennis. It&apos;s easy to plan an outdoor adventure and rent equipment at Roanoke Mountain Adventures. However you choose to enjoy the park, know that great drinks and food are nearby at The Green Goat and Wasena City Tap Room and Grill. Five picnic shelters make Longwood Park a popular location for reunions and other celebrations, as well as community events. Kids entertain themselves and each other on the playgrounds, of course. Who’s up for some cyclocross? The region’s only cyclocross course is at Fallon Park, which is also home to an annual September race series. What’s more, the park offers Greenway access to let you roll on street tires, walk, or run. Picnic shelter available. Just off Electric Road in Salem is the Rotary Park, an access point for the Greenway and a popular put-in spot for kayaking the Roanoke River. There’s also ladder ball, if you care to give the ropes a fling. How do you love Virginia’s Blue Ridge? Oh, if we could only count the ways. You could show us, however. Instagram what you love and tag it #BlueRidgeDay to show off your outdoor skills and passions. For more inspiration, see our section on Outdoor Adventure. 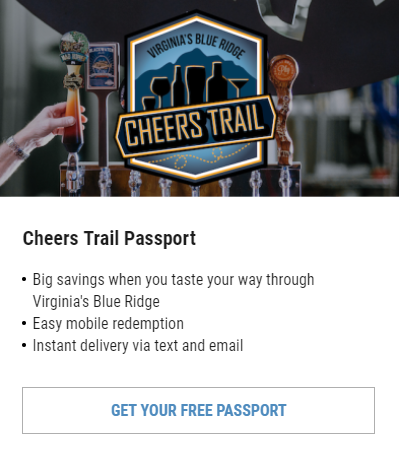 You&apos;ll also love exploring the Blue Ridge Parkway and Carvins Cove, two other popular public lands in Virginia&apos;s Blue Ridge.